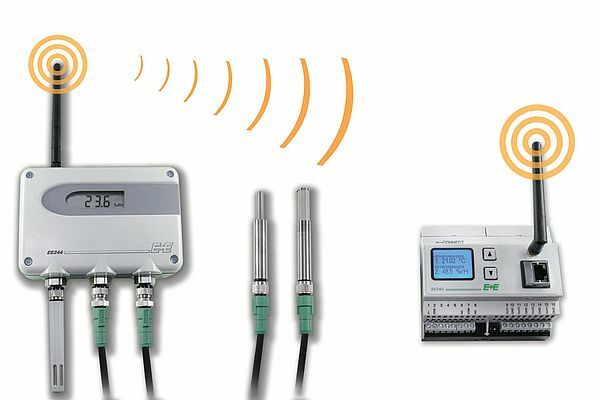 E+E Elektronik presents for the first time the new digital humidity and temperature sensors EEH110 and EEH210. The integrated E+E proprietary coating protects the sensors optimally from pollution and leads to excellent long-term stability even under harsh conditions. Several interfaces and supply voltages (3 V or 5 V) allow for easy integration of the accurate RH/T sensors in a wide range of applications. By employing the E+E proprietary coating, developed for harsh industrial environment, EEH110 and EEH210 set a new standard on the digital sensor market. A special layer protects the active sensor surface from contamination and corrosion, which considerably improves the long-term stability. Additional components, such as filter caps, are not required. This simplifies the design-in of the sensors, reduces space requirements and significantly helps to reduce costs. Precise humidity and temperature factory adjustment ensures a high accuracy of ±2% RH and ±0.3 °C (±0.5 °F). The measured values are available on I²C, PWM and PDM digital interfaces. Additionally, EEH210 features a SPI interface, while EEH110 offers an analog output for relative humidity. The choice of supply voltage, 5 V for EEH110 and 3 V for EEH210, increases the versatility of the sensors. With very small dimensions of only 3.6 x 2.8 x 0.75 mm (0.14 x 0.11 x 0.03 inch), the sensors can also be used in applications with space restrictions. EEH110 and EE210 are optimized for mass manufacturing and can be processed automatically thanks to the DFN enclosure. The digital RH/T sensors are ideal for use in smart home applications, in air conditioning or in the field of consumer and entertainment technology.